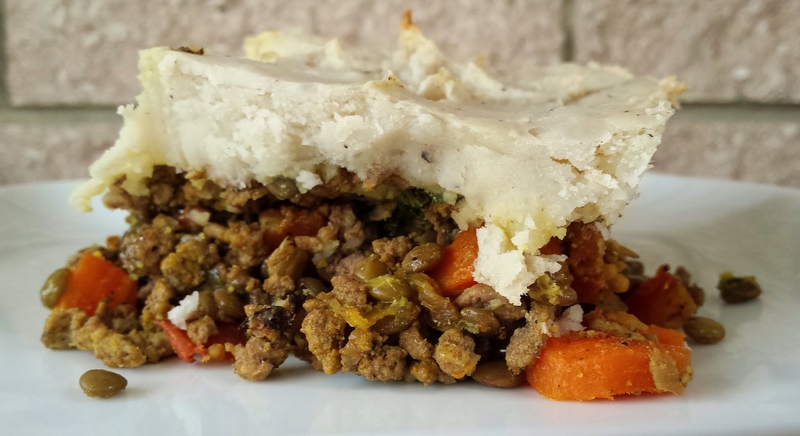 I got the idea to create a shepherd’s pie with a Mediterranean influence by brainstorming about some of the ingredients that traditionally comprise the dish and wondering what I had in my pantry that I could swap for them. “Well, lentils are sort of round, and I have those,” I mused, thinking about what could be a legitimate substitute for corn and peas, two typical components. Not that similarity in shape is necessarily any indication of a sound substitution! But that’s what led to the idea to give my shepherd’s pie a Middle-Eastern twist. This variation is as hearty and filling as the traditional one but contains exotic spices and ingredients that make it a little more interesting. Add lentils and stock to a medium-sized pot. Bring to a boil, then reduce to a simmer and let cook uncovered for 20 minutes. In a large pot of boiling water, cook potatoes for 15 minutes, or until soft when you pierce with a fork. Cook the carrots in a separate pot of boiling water until soft, about seven minutes. Drain water for both when done and set aside. Cook hamburger meat in a large skillet over medium heat for about five minutes, or until fully browned; drain and set aside. To a large pan, add the grapeseed oil and diced onion and cook over medium heat for about three minutes, until onions are lightly browned. Reduce heat to low and add the garlic, tomatoes, parsley, and seasonings; mix well, then allow to cook for another minute or two. Once everything is done cooking, combine the lentils, carrots, hamburger, and the onion mixture together in a large mixing bowl. Coat the bottom of a baking or casserole dish (I used a 9×9-inch baking dish) with the resulting mixture. Now it’s time to mash the potatoes. Add the melted butter to the pot with the potatoes and mash well with a masher or hand mixer. Add the milk, salt, pepper, and cumin and mix well. If potatoes are too thick, add more milk. Top the hamburger mixture evenly with the mashed potatoes and bake for 30 minutes, or until the potato crust is slightly browned. Yields six to eight servings.